Cheyenne and 'Butterscotch' clinched the junior showmanship and Champion Hereford at their county fair. Congrats to Tyler Thompson with a Hunt Bros steer. 2nd place at 2016 Indiana State Fair. Great job Tyler. HB/AA Katrina 5030, the March 23, 2015 daughter of DelHawk Kahuna 1009 ET that was shown by Kyndall Williams. This heifer was Reserve Grand Champion at both the Buckeye Junior Hereford Premier Show on Saturday in Wooster, Ohio, and again on Sunday at the Eastern Ohio Junior Hereford Preview Show. 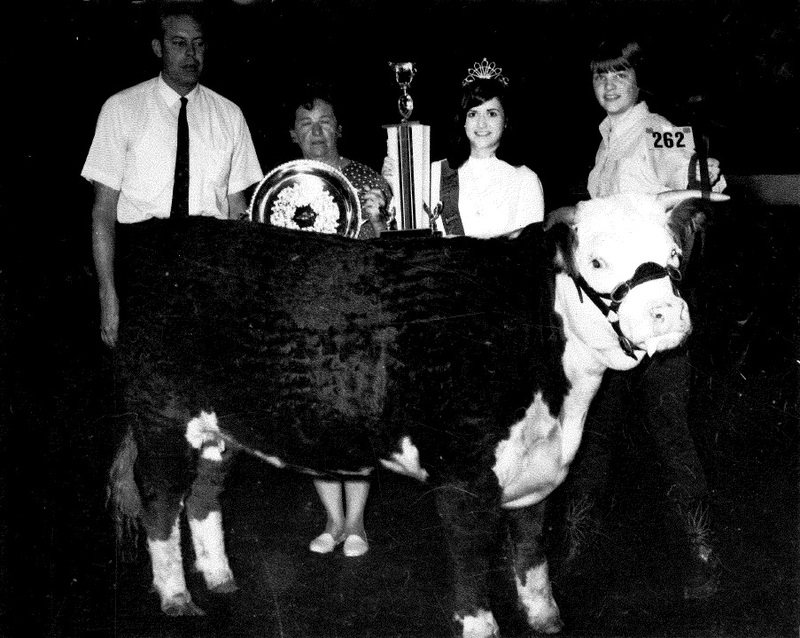 This HB heifer was Champion at the State Fair........in the era when "curling" hair was the treatment. This picture was found when visiting Bob and Trudi Peterson's home. In addition, Don and Dale Lehe each showed a HB Hereford Heifer that were Champion at the ISF sometime in this era. These pictures have not surfaced.